My dad was from northern Alabama, so I always keep an eye out for southern recipes that I can use. Northern Alabama has a peculiar regional spin on a barbecue sauce I had to try. It has a sharp tang provides a beautiful finishing crust, but unlike other sauces that are tomato or mustard based, this sauce is white (or beige). Since the 1920’s, the “white sauce” bbq capital of Alabama has been Big Bob Gibson’s in Decatur. Different from most tomato or mustard based regional sauces, this sauce has a mayonnaise base. I know, my first reaction was “I don’t know about this”. The vinegar and horseradish provide the tangy kick you need with bbq sauce and the mayo browns into something special. Feel free to add some minced jalepeno or crushed pepper seeds if you want an extra zing. 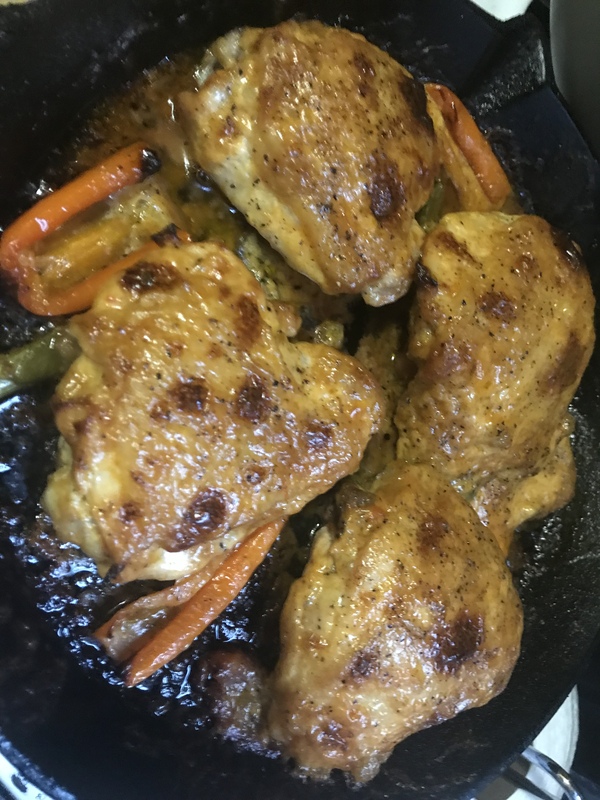 I tried it on oven baked chicken and was very happy with the finger licking results. I will definitely try it on grilled seafood and pork in the future. Go Tide! Blend or whisk together in bowl. Store in mason jar or Tupperware and let chill in fridge for at least 2 hours (this can be made days in advance). Prior to cooking, marinade 6-8 pieces for two hours in fridge. Reserve about a half cup or so for finishing, before you put it in contact with the raw chicken, to pass with the grilled chicken after. This sauce will stay in fried and can be used on anything from sandwiches to salads. Chicken with Alabama white sauce before cooking. Add some peppers or scallions to your cast iron skillet before baking.